Last updated: February 12, 2019. Please see notes beneath the grid. The "Carpool Drop Off Time Range" indicates the span of time a student may be dropped off for school, this is when staff supervision is available for students in those grade levels. Only Lower School students who are enrolled in the before school care program (Kids On Campus) may be dropped off before 7:30 a.m. Lower School students not enrolled in morning Kids On Campus may not be dropped off before 7:30 am. 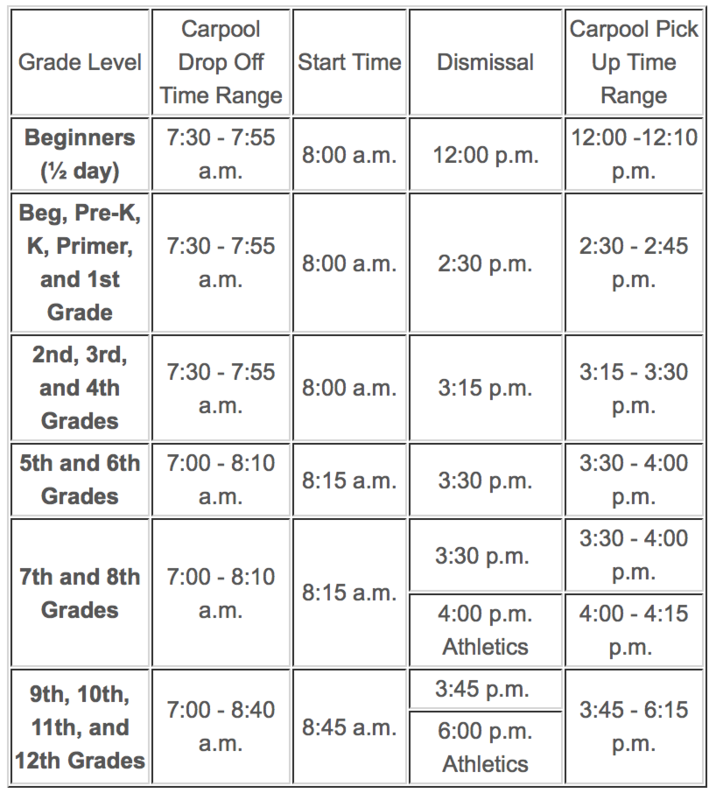 In the "Dismissal" column, the 4:00 p.m. and 6:00 p.m. are the after-school athletics practice end times. On average, 85% of 7th and 8th-grade students play a sport in each of the three seasons; on average 45% of Upper School students play a sport in each of the three seasons. These participation numbers significantly ease carpool congestion at the normal end of school carpool times. Note that the upper school athletics practice times sometimes vary, 6:00 pm is the most typical end time. The "Carpool Pick Up Time Range" indicates the time range students will be ready to be picked up from school. Adhering to these time ranges will help ensure carpool runs as smoothly as possible and decrease congestion of cars stopped in line whose children have not yet been dismissed. The queuing times (the earliest you can arrive for pick up) will be shared when the TMP is finalized in April. Both Montwood and Merrell offer more than 1,000 feet of queuing space, accommodating 48 and 42 cars, respectively. The loading areas on both sides of campus can accommodate at least five vehicles loading and unloading simultaneously. These numbers are shared to demonstrate that there is ample queuing space for our carpool operations to run smoothly. Middle School parents are asked to arrive for athletics practice pick up no earlier than the published practice end time. There will not be a published queuing time range for after athletics practice carpool. If the 3:30 p.m. carpool line is still in process, parents of student-athletes who arrive before the published athletics carpool pick up time may be asked to return at 4:00 p.m.
All Lower School students will be dropped off and picked up on the Montwood (south) side of campus. Families with children in multiple divisions must use the Montwood carpool lane when picking up or dropping off their Lower School student with older siblings. PLEASE NOTE: Remaining details of the carpool process and traffic flow in and around campus during the drop off and pick up times will be finalized when the school's overall traffic management plan is approved. This includes all carpool drop off and pick up locations, queuing time ranges, and other related details. We anticipate the plan will be finalized in April. All information will be shared with our community at the earliest possible time. Thank you for your continued patience and understanding as this important work continues.